Wood-Mizer was founded in 1982 by Don Laskowski and Dan Tekulve when their groundbreaking idea was developed to make converting logs to lumber a safe and efficient one-person job. With the innovation of a portable band sawmill and thin-kerf blade technology, Wood-Mizer sawmill equipment allowed anyone to process wood economically and a revolution began for wood producers around the world. Wood-Mizer founders Don Laskowski (left) and Dan Tekulve. For more than 35 years, Wood-Mizer has earned the reputation as the world’s leading manufacturer of portable band sawmills with more than 70,000 bandmills sold in 120 countries around the globe. 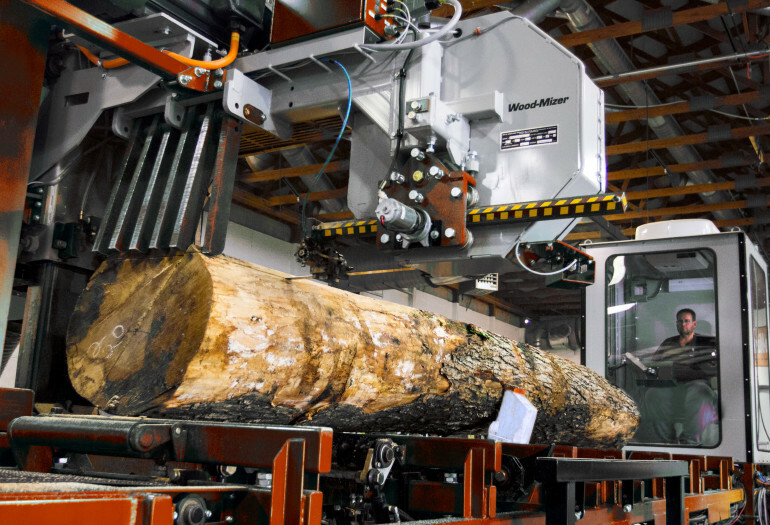 With branch offices located on five continents and more than 100 authorized distributors worldwide, Wood-Mizer is committed to global customer success with sawmill equipment that will successfully mill any type of wood species from softwoods to extreme hardwoods. “I do not think that there is a country in the world that does not have at least one of our sawmills,” said Richard Vivers, Wood-Mizer Chairman. Wood-Mizer equips the modern timber processor with smarter products that increase profitability and promote sustainability. “People are much more aware of the need to conserve and maintain forest cover,” said Vivers. “They are realizing how important it is for the environment and preserving the resource for the future. We want to play our part in that as well.” The Wood-Mizer portable line of sawmills and wood processing equipment provide a wide range of opportunities for small businesses and individuals including foresters, arborists, woodworkers, and farmers. They are actively growing their local economies, creating jobs, and improving living standards in all corners of the world. Wood-Mizer provides the modern timber processor with portable and industrial sawmilling equipment for turning logs into lumber profitably and efficiently. Wood-Mizer is committed to customer and employee success, putting compassion and faith at the forefront of the operation and committing themselves to providing high-quality equipment that makes a positive difference in people’s lives. “As you get to know Wood-Mizer, you’ll find we not only have the best technology, but we also strive to build a relationship with our customers,” said Vivers. As a 100% employee-owned company, we believe that each and every mill owner is an extension of our Wood-Mizer family – a philosophy that makes customers feel right at home. In addition to the industry leading portable sawmill equipment line, Wood-Mizer manufactures a wide range of bandsaw blades to cut any species of timber in any part of the world. From economical carbon-steel blades for continuous production sawing to premium and durable carbide-tipped and bi-metal blades, Wood-Mizer blades provide versatility, performance, and quality for all timber sawing applications. Wood-Mizer manufactures more than 10,000 miles of blades for the worldwide market each year with a dedication to quality engineering. Wood-Mizer is a sawmill manufacturer that also produces sawmill blades. Modern manufacturing facilities in Indiana, USA and Kolo, Poland guarantee maximum quality at an affordable price anywhere in the world. Premium steel and the highest quality components are paramount to the Wood-Mizer product line. Lean manufacturing principles and continuous improvement in all departments constantly find new ways for improving processes, quality, and speed. Stringent quality control and constant improvement are implemented in every step of manufacturing, from initial conception and development to final assembly of every individual product. Manufacturing in the United States and Poland guarantee maximum quality products at an affordable price anywhere in the world. Stringent quality control and constant improvement are implemented in every step of the manufacturing process.